Depending on the climate and the amount of snowfall, the season usually starts in November and lasts until April or even June. Damavand trekking and ski touring. Ski and snowboard tour organizer Tehran. Ski mountaineering adventure tours Alborz and Zagros Ranges. Damawand winter climb, ski and snowboard talks and discussion. Tochal is one of the most favorite ski pistes in Iran. 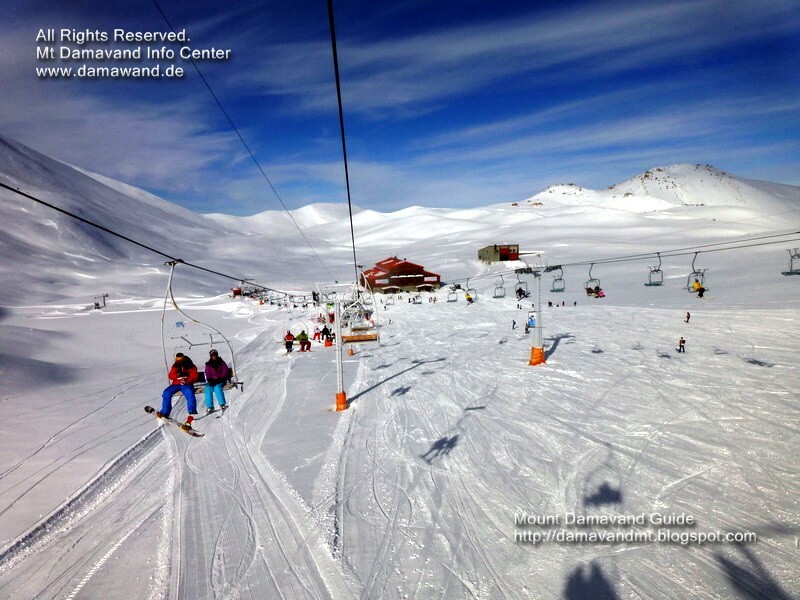 Tochal Ski Resort is the closeset ski centre to Tehran and due to its neiggourhood to capital it is quite popular with the single daytrip skiers. It is the 5th highest ski resort in the world, it has a gondola (telecabin) lift 7.5 Km long which is one of the longest in the globe. It takes less than an hour from the 1st station to the last station by car cable. The highest point of the run is located just uner Mt Tochal peak 3970m, it is an ideal place for ski and snowboard beside other winter activities. 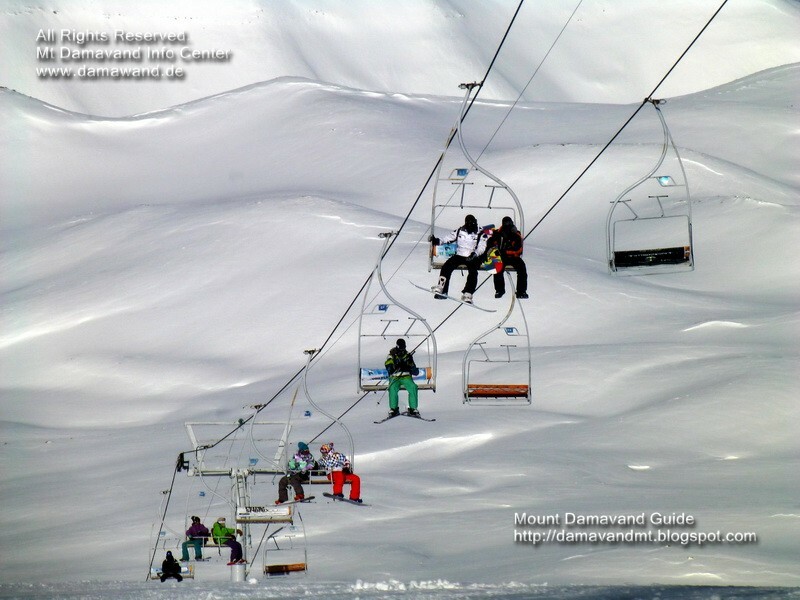 Tochal Resort is near Damavand and is the best places for practice before attemting Damavand Ski Mountaineering. A very cool way to become accustomed to Iran ski climate in a short form itinerary. In the first days of your ski itinerary, you may use Tochal resort. Visit also Tochal Weather Forecast. The resort has two chairlifts and one T-bars. There are seven stations on the telecabin route, the resort is located at the seventh station, there are restaurant at fifth and the seventh staion, and a nice hotel called Tochal Hotel at the base of the resort 3550m, with 30 rooms and suites. Tehran > Chamran Highway > Velenjak St.
Tochal trekking and ski touring. Mt Tochal ski and snowboard tour organizer. Mount Tochal ski adventure tour. Ski adventure tours Alborz and Zagros Ranges. Damawand winter climb, ski and snowboard talks and discussion. Downhill ski expedition tours Tochal Mountain. Iran mountain adventure tour organizer. Info for hiking trekking and climbing Tochal Tehran. Tochal Skitouring Tehran. Iran Tochal Ski Resorts. Iran Alpine ski and snowboard tour organizer. Skiing in Alborz and Zagros Mountains. Mount Touchal Tehran Iran.